It is New Year’s Day and something about the turning of a calendar year makes my heart race. I love looking forward, dreaming, planning, and stepping out of the accidental boxes that have erected around the way we live and the way we think. Every year in these first few days, Zac and I sit down for a few hours and take inventory of all the parts of our lives and dream about the changes we hope to see. I thought that this year it would be fun to share our little process with you- I hope it will be as helpful for you as it has been for us. So steal away alone, with a good friend, or your spouse, and dream a little today or this week. 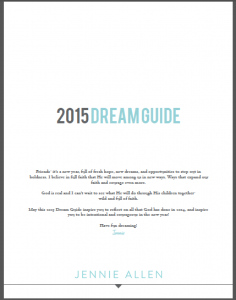 Click the image below to submit your email and receive the 2015 Dream Guide! It is just a few pages to guide you through this process. Post photos of your time taking inventory and use the hashtag #dreamguide. I can't wait to see how God inspires and challenges you! FeeFee lives in rural Haiti, in a tiny mortar house, with her 3 young children and a husband. Everyday she builds a fire and pops popcorn to sell for 5 cents a bag, outside their little home to help pay for her kids schooling. Her husband, August, lays brick every day that he can find work. She and her husband survive, do they have the luxury of dreaming? They lay bricks and pop popcorn and sometimes their children sit down for dinner and FeeFee only can offer them leftover popcorn. But FeeFee tears up at the word dream because she lives closely attached to one. She dreams that her children would have a better life than she has - a life without popcorn meals. We all dream... but if you are reading this, likely you have the luxurious obligation to dream. We live at a time in history that affords us something that many have died for - the freedom and opportunity to dream and accomplish our dreams. We are not engaged in an invasive war, we are not looking for food in trashcans, we are not slaves without rights, we are not simply surviving physically as many, many, possibly even most generations before us have. We posses the right and the power and resources to dream crazy dreams and we take it for granted. We numb out and miss that we hold more resource and purpose than nearly any generation has before us. With our freedom, with our comfort, with our security - We get to dream. We get to build. We get to hope. We get to change. We get to impact. We get to respond. It is a glorious luxury and our greatest responsibility because to whom much has been given - much is expected. What changes are you hoping to see in your life this year?